The Land of Untold Stories strikes again this week with a surprising blast from the past. With a great Hook-centric episode, Once Upon A Time has gotten back on track. Reconciliation, family bonds, and revenge are brought back to the forefront, which is what this show has always been about. I never thought I would see the day when Twenty Thousand Leagues Under the Sea would be the story-of-the-week on Once Upon A Time. Nemo and crew make their first appearance in a flashback during the time of the Dark Curse. It turns out that Hook has a secret connection to the first mate of the Nautilus, which is discovered later in the episode. Nemo is led to the revenge-driven Hook by a magical harpoon and wants to make Hook his newest crew member. It’s an odd story and doesn’t seem to fit in the context of the show, but the present-day version will at least drive the show forward. In current time, the Evil Queen shows up at Emma and Hook’s residence to see Henry for ulterior motives. She tells him about the special scissors that Hook didn’t get rid of in order to try and drive a stake through part of the family. Henry gets super upset by the news and takes the scissors down to the docks to get rid of them. 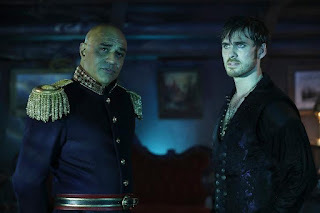 When Hook shows up to stop him, they are both taken by the crew of the Nautilus. Hook is forced to rekindle his bond with Henry, who currently isn’t happy to be around him. Hook reveals to Henry that the reason they were captured is his mystery connection. Funny enough, Hook’s orphaned half-brother, Liam, is the new captain of the Nautilus and wants Hook dead. As we know, Hook murdered his father and left Liam as a young, orphaned boy. Liam is revenge-driven, and Hook wants both Liam and Henry to know that he isn’t like that anymore. Hook wants to make a family with Emma and Henry and doesn’t want to rip them apart. By making a sacrifice, Hook proves himself to Henry. It was a tender moment and a very happy one because it verifies Hook’s place within the family. The other silver lining to the story was Liam and Hook forgiving their differences and coming together. Hook being the main character of this episode was great because he hasn’t been too involved this season. He has needed confirmation of his position with everyone, so it’s good that he worked out problems with two people. A small storyline of the episode was Belle’s changing thoughts on Rumple. After bumping into Snow at the town hospital, Belle realizes that she isn’t sure whether she wants to keep Rumple out of her and the baby’s lives or not. At first, she thinks that there’s no way she wants Rumple around. But after her ultrasound, Belle decides that maybe Rumple can change. She feels that she can possibly reconcile with him and goes to the pawn shop to give the extra ultrasound photo to Rumple. It’s good that Belle has probably turned a new leaf. She is going to need Rumple around once the baby comes, after all. On the other hand, Rumple may also have had a change of heart. He revealed to the Evil Queen that he wants the magical scissors for his own purposes. He hints that he might want to cut his own magic string to get back with Belle. There are going to be some moral dilemmas coming up in the near future, so it should be good to watch what happens next. The most fun character of the season is the Evil Queen. She has consistently been a great addition to the show and brings the fun. This week, she is up to a lot of trouble. First, she stirs up the dissention between Hook and Henry. Her ultimate plan is to rip apart the Charming family one person at a time for seemingly no other reason than because it amuses her. It is fun to watch Lana Parrilla kill it in a great role. After her first plan goes awry, the Evil Queen moves on to plan B. This time, she decides to manipulate Rumple more than usual. She is trying to play him like a fiddle and get whatever it is she actually wants. She says that her one desire is to kill Snow White, but what else is new? It’s hard to say whether she is telling the truth or not, but there has to be more to her evil plan. I can’t imagine that the only evil act she truly wants to commit is destroying Snow White. The Evil Queen seems to be two steps ahead of everyone at all times. She has a grand plan and is executing it at her own pace. She doesn’t get very upset when something doesn’t go quite according to plan, which leads me to think that there is something more there for her. There’s more that we don’t know because the Evil Queen is more docile than she was in the past. She will be the most interesting character to watch for the next few weeks because, as always, she’s running the show.